Vilma Soltesz widow settles $6m lawsuit after obese wife was denied flight before dying. Did Vilma Soltesz have a reasonable expectation that she should be able to be flown back to the US? Vilma Soltesz‘s widow, Janos Soltesz, 57 has settled a $6 million lawsuit against three airlines, each who barred the man’s wife from boarding planes cause she ‘too fat’ to fly. At the time of the woman’s death, in December of 2012, Vilma Soltesz weighed 407 pounds. She’d come to die at the couple’s home in Hungary after being precluded from flying back to NYC to receive necessary treatment, despite having flown with the carriers out of the USA. The three airlines involved in the settlement included Delta, KLM and Lufthansa. Man now blames airlines for failing to prevent the death of his 425 pound wife. Is he right? Reports tell that the widow would settle his wrongful death suit last month for an undisclosed amount. The suit said the couple were sent on a ‘wild goose chase’ across Europe in October 2012 by the airlines, which ultimately caused the woman’s death. 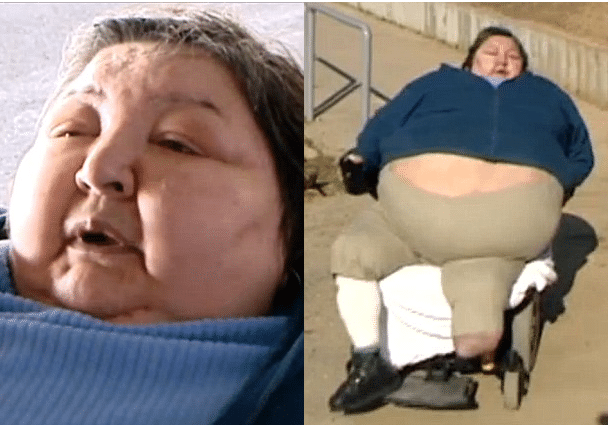 Morbidly-obese Mrs Soltesz was also wheelchair-bound by an amputated leg and suffered from diabetes and kidney disease. She was found dead at the age of 56 at her vacation home in Hungary in October 2012, days after several aircraft crews repeatedly failed to accommodate her size despite telling her they could do so, according to the lawsuit which was filed in federal court in Manhattan last October. The couple left their Bronx home in September 2012 on a Delta Air Lines plane, securing two seats for Vilma and one for her husband. The couple arrived safely in Budapest on a vacation, according to the lawsuit. By October 2, 2012, Vilma Soltesz sought treatment at a hospital in Hungary when she fell ill. She was released and told she could fly home but to see her doctor immediately upon her arrival. The pair would attempt to leave Budapest two weeks later on a KLM Royal Dutch Airlines flight, with seats similar to what they had on their flight from the United States, but a captain told them to disembark after Vilma Soltesz struggled to maneuver from her wheelchair into her assigned seats. After waiting in a Budapest airport for more than five hours, the couple drove to Prague to catch a Delta flight they were assured could accommodate them. But Delta did not have an adequate wheelchair to transport Vilma Soltesz to her seat, told the suit. ‘The Delta flight coordinator told Janos and Vilma that Delta ”did not have access to a skylift” to get Vilma onto the aircraft from the rear, and that there was nothing more Delta could do for them,’ the lawsuit stated. ‘Exhausted and feeling ill,’ Vilma Soltesz went to bed after the couple drove back to their vacation home in Veszprem, Hungary, the lawsuit says. On October 24, Janos found her dead – nine days after she was supposed to have seen her doctor in New York. In essence the question would be was it a violation of the disabilities act to kick the woman off the plane or an issue of safety for fellow passengers to allow the woman on the plane? The airlines did not cause her death. The morbid obesity caused her death. She was too sick to fly. The only mistake that the airlines made was to fly her out in the first place. Husband and wife seen futilely attempting to catch a ride back to the US.